It's that time of year again for one of our convention staples. 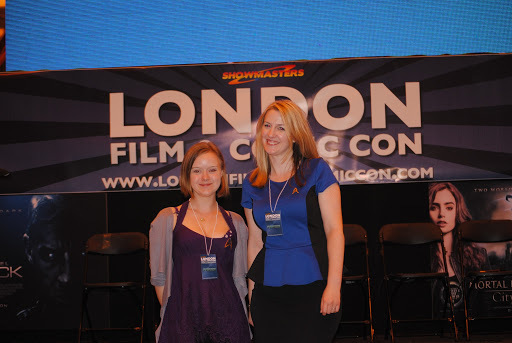 Showmaster's London Film and Comic Con. We've been attending these for years. It feels like that familiar family holiday we take together. But this year stands out. This year it was BIG!! There was some serious guest star pulling power happening. We heard that it was going to be hot and that it was crazy busy (It always seems to fall on the hottest day of the year!). We prepared ourselves mentally and physically for this away mission. Lots of water, tiny TNG skant dresses, water, we even bought new boots that were super comfy (sign that we're getting old). Armed with this and psyching ourselves up for standing around in a sweaty moshpit, we were actually relieved to find it wasn't as bad as we had imagined it to be. 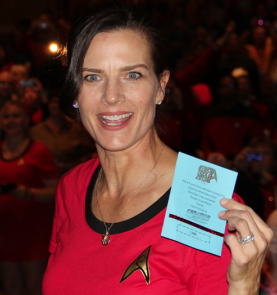 Showmasters always seem to be looking out for us Trekkies and if you frequent their Forums you will have seen today's announcement that Terry Farrell and Diane Muldaur will be attending next years show! We have only seen them both once and that was quite a while ago now, and in the States. Terry is as popular with us fans as Dax is with the entire Alpha Quadrant. 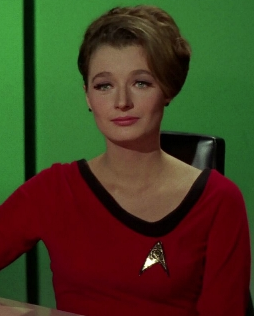 Did you see those pics of her at Las Vegas con this year dressed in the TOS mini dress for the costumed world record attempt? What a team player! Writing a post is like entering the shuttlebay doors after a long away mission. Real life pulled us away for a while and we're a bit behind but got plenty to talk about. Thanks to all of you who followed our tweets at LFCC, it was a fantastic event with a plentiful and enjoyable Star Trek guest lineup. After a brief period of having to deal with real life 21st century issues we are grateful for a distraction this weekend and will going on an away mission to London Film and Comic Con! It's the best bit about British Summer Time if you ask us! Despite being early and having a schedule that a Space Station operations manager would be proud of, we still managed to be 15 mins late to the Star Trek talk (the horror!). This consisted of Gates McFadden, Elizabeth Dennehy, Hallie Todd and Tracee Cocco. As Sam walked in she pointed at Tracee and yelled ‘Ohh its HER from ops!’ - so crass! Here is a brief taster from Saturdays London Film and Comic Con. Sorry about the sound quality, but as you can hear, the place was buzzing!